The Oshawa Power played valiantly but came up a bit short in their inaugural National Basketball League of Canada game to the Quebec Kebs 104-101. The Power showed signs of dominance throughout Sunday afternoon‟s contest against the Kebs. The Power got off to a great start taking a two point lead after the first quarter, and looked to be in cruise control after starting the second quarter off with a 10-1 run. Canadian Tut Ruach etched himself into Oshawa Power the history books by scoring the team‟s first points after knocking down an early three to make the score 4-3 Quebec. Ruach continued his strong play, carried over from the preseason, finishing the game with 3 points, 10 assists and 5 rebounds. “At the time the shot felt like most other baskets I‟ve scored in my career,” said Ruach. Fellow Canadian Kevin Francis hit some timely baskets in the first half to help the Power jump out to a 51-46. Francis finished the game with a near double-double of 13 points and 9 rebounds. Brandon Robinson led the Power with 16 points and had 5 rebounds. 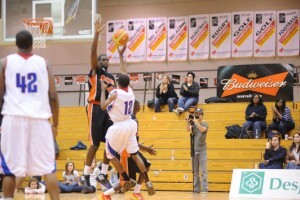 Quebec‟s seized the momentum during the third quarter, the only quarter the Kebs would win 32-24. 12 three point field goals the difference by the Kebs in this back and forth affair, as the Power were never able to distance themselves enough to close out the win. Royce Parran of the Kebs finished the game with a near triple-double 21 points, 8 rebounds and 9 assists. The Power will play their regular season home opener on Thursday, November 3 at the General Motors Centre, where they will tip off against the Moncton Miracles at 7:30 p.m.